Treating the prostate with radiotherapy alongside standard treatment led to an 11 per cent increase in survival for some men with advanced prostate cancer, show the results from a study carried out in collaboration with the University of Birmingham and funded by Cancer Research UK. These findings, from one of the largest ever clinical trials for the disease, are being presented at the 2018 ESMO Annual Meeting in Munich, Germany and published in The Lancet, today. Previously, it was unclear if there was any benefit treating the prostate directly with radiotherapy, if the cancer had already spread. This research helps answer that question and has implications beyond prostate cancer. 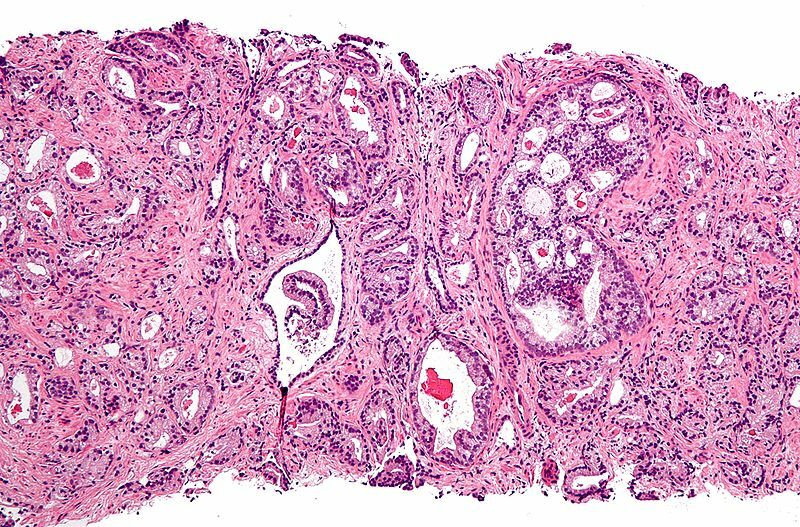 The findings from the STAMPEDE trial could be practice changing and suggest radiotherapy, alongside hormone therapy, should become the standard of care for a group of men with advanced prostate cancer, affecting thousands every year in the UK. This part of the STAMPEDE study, based at the MRC Clinical Trials Unit at University College London, involved around 2,000 men who had advanced disease. Half were given standard treatment while the other half received standard treatment and radiotherapy to the prostate – the site of the primary tumour. They found among men whose cancer had spread to their lymph nodes and/or nearby bones and were treated with additional radiotherapy, around 80 per cent survived for at least 3 years. In comparison, 70 per cent of men who did not have the additional radiotherapy treatment, were alive after 3 years. The benefit was unique to this group of men, with no increase in survival among men whose cancer had spread further to other organs or distant bones. Around 47,000 men are diagnosed with prostate cancer every year in the UK, and over 11,500 men die from the disease. In this study, 40 per cent of men with newly diagnosed advanced prostate cancer were in the group with disease that had spread to their lymph nodes and/or nearby bones, suggesting the findings could potentially benefit more than 3,000 men every year in England alone, and many thousands more worldwide. Dr. Chris Parker, lead researcher of the study based at The Royal Marsden, said: “Our results show a powerful effect for certain men with advanced prostate cancer. These findings could and should change standard of care worldwide. Kevin Webber, age 53, although not part of the trial, received radiotherapy to the prostate as part of his treatment for advanced prostate cancer at The Royal Marsden. He said: “I discovered I had prostate cancer in November 2014 and was given a prognosis of as little as two years. My tumour had spread to lymph glands in my abdomen and chest, so I didn’t think radiotherapy was an option for me until Dr. Chris Parker raised the possibility of it. Professor Charles Swanton, Cancer Research UK’s chief clinician, said: “This is a monumental finding that could help thousands of men worldwide. STAMPEDE is making great strides in finding new ways to treat prostate cancer with previous results from the trial already changing clinical practice – data released previously has led to docetaxel chemotherapy now being part of the standard of care for many men with prostate cancer.